In the afternoon, one of my baby’s pleasures is a boudoir, which is a light, melt-in-your-mouth eggwhite-leavened sugar-dusted biscuit. This is after he’s had his petit suisse, a soft white cheese a little bit like Philly. Before you stamp your foot in indignation that I give my baby something dusted with sugar after all the agony of deciding how to feed him, I will let you know his pediatrician put it in his recommended diet! My boy is expending a whole lot of energy these days. He’s going full steam learning, moving, practicing, playing and thinking very hard about the world around him from the minute he wakes up until he drops from exhaustion again, on and off like a lightswitch, all day long. If he doesn't get a boudoir, he gets a crust of baguette. I think he likes them both equally. I started making boudoirs at home out of curiosity. I wondered about them when the baby first started eating them. They are ubiquitous at the grocery stores here in France, and marketed not only for consumption by babies, but also for making that decidedly adult dessert called a charlotte, which is often lined with boudoirs soaked in various alcohols. The thing was, when I got down to it and began digging around for information, I noticed that these days nobody ever bothers to make their own boudoirs. Like other pastries, these are left to the professionals in this country. But you can find recipes in the older cookbooks sometimes under other names, depending on the region. I checked out a couple of pretty picture cookbooks in the French style devoted to the charlotte from the library, thinking that at the very least these books would feature a a recipe or a little bit of lore about this famous cookie and found, much to my surprise, that they don't even bother to put the recipe for the boudoirs into either book. Tucked neither into the front nor the back, boudoirs were simply an ingredient, one that busy French cooks buy ready-made in plastic sachets at the store. I did find a few recipes in my old cookbooks and scaled them down to a manageable size. This means something I can handle without baking all day. I wanted to make sure I could get these done without feeling I was going into industrial production mode. If you have a big American oven, you might even be able to get these all baked in one batch. 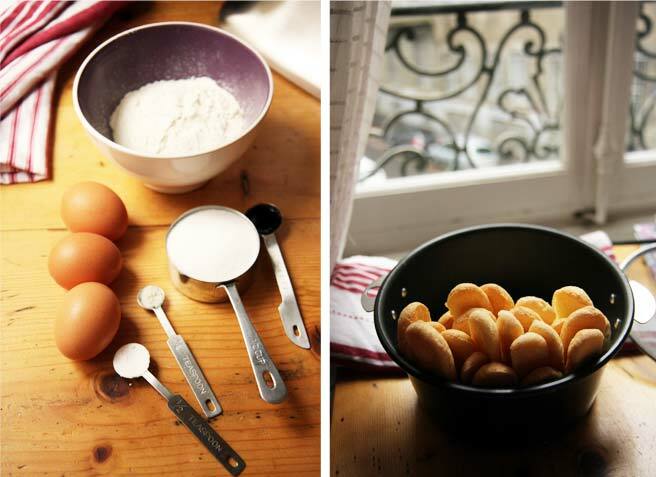 The recipe for boudoirs aka biscuits à la cuillère is quite straightforward and simple. It requires no special equipment other than a plastic food storage bag or if you’re equipped, a pastry sack with a 1 cm circular nozzle to pipe the batter. Once they've cooled off, you can store them in a tin. If there are any left after a few days, they’ll hold up quite well to soaking in liqueurs and syrups for many kinds of charlottes. *Note about the cream of tartar: It is optional. I have just found that the cookies hold their shape better if you do. I have done these cookies with and without it and the taste is the same. It's just a matter of preference. *Note about the bowl size: I use the standard bowl that goes with my mixer for the egg whites, and I use a smaller bowl (the one I use to melt chocolate over a saucepan) for the egg yolks. The small bowl eventually takes the rest of the ingredients for the batter. The good thing about it is that the smaller bowl fits into a 12 inch square plastic bag, and it makes transfer of the batter into the bag quick, clean, and painless. Keep that in mind when organizing your tools to make these! 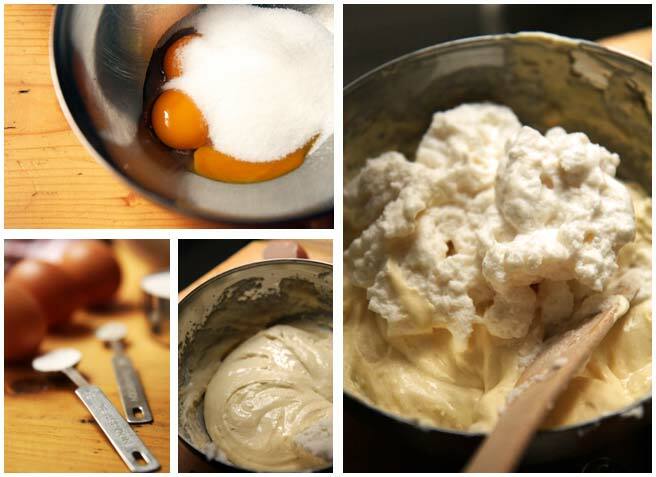 - Separate the eggs, yolks into the smaller bowl, whites into the bowl that comes with your mixer. - Beat the 1/2 cup granulated sugar and egg yolks together until pale yellow and fluffy. - In a separate bowl, mount the egg whites with the vanilla extract and 1/2 teaspoon cream of tartar until stiff peaks form. - Stir the salt into the flour. - Incorporate the egg whites and sift in the flour and salt little by little into the egg yolks and sugar mixture, alternating flour and whites, ending with the whites. Make sure you fold it in gently and carefully and don’t stir it too much to avoid deflating the batter. - When it it just incorporated, transfer it into the bag for forming the boudoirs. - Cut off a corner of the bag to make a hole about a half inch wide or one cm. You can make a wider cut, but it will make flatter, wider, biscuits. I cut the hole about the width of my thumb nail for the thinner biscuits. - On a parchment lined cookie sheet, form the boudoirs. 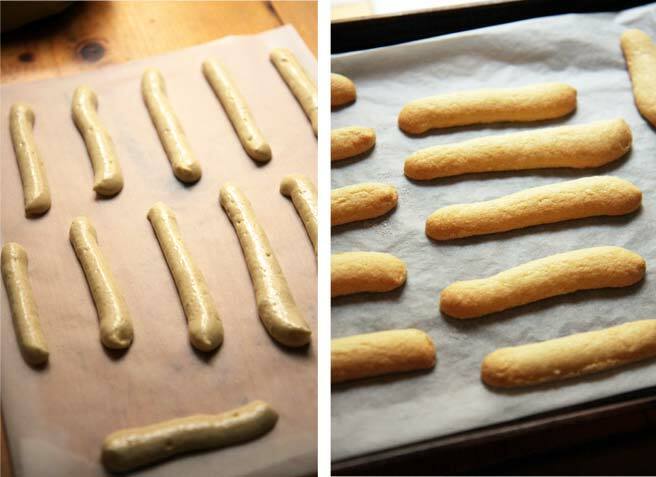 Pipe the fluffy batter onto parchment in straight lines, 2-3 inches or 4-6 cm long, with about an inch or 2 cms between each one. - Sprinkle sugar over the top, and lightly shake off the sugar from the parchment. The biscuits will stick to the paper, so you can pour the sugar off being careful. - Bake at 300F or 145C for 18-20 minutes, until they are a toasty pale brown under their sugar coating. - Remove them from the baking paper right after removing them from the oven. - After cooling, store in a tin for up to a week. If you plan to use these biscuits for a charlotte, keep them in the tin for a few days. They hold together better when soaked in liqueurs that way. Those tiny fingers, holding tight to that dainty sweet, are now clasped tightly around my heart. boudoirs are my very favourite biscuits. so soft and delicate. Lucy you're going to hopelessly spoil this kid. He'll never eat anything but gourmet food the rest of his life. When he grows up he will be either a Michelin taster or a celebrated chef. Or maybe he will publish cookbooks full of mom's recipes. this is so sweet...my daughters also used to love them as babies(only they were storebought..I wasn't as good a mom as you..heh heh! Oh, yes. Those tiny fingers. Rachel got it right. He's a lucky little baby. Little fat baby fingers are the next best thing to the back of a baby's neck . Closely followed by one of your boudoir biscuits , by the sound of it ! With or without the sugar toppings they are tasty. How nice to be able to make sweets for your sweet one. My son used to wake up and even before he opened his eyes, would say, "what's for breakfast, Mom?" He's now 6'3" and a deputy sheriff. I was teaching him to cook by the time he was three--he worked as a salad cook in an Italian restaurant while in high school. What a lucky boy to have a mom who can make him homemade treats! Ian looks as though he's really enjoying his homemade treat. Although we can't see his eyes he seems to be concentrating on his boudoir and his fingers in the second photo. Thanks for sharing the recipe. I'll be trying it this weekend. Lucy, I can feel the love you have for your darling boy. Good for you for feeding him well. He is a lucky, lucky lad! :) He is beautiful. I adore the way you have captured him relishing the treats made lovingly by his mama! This brings back such sweet memories of my son when he was little, those chubby cheeks! Ah! True, impressive that you've made your own. Inspiring. I'm inspired. I'll add them to my list of things I must bake! Those look so so perfect in your sweet baby's chubby hands!!! Your little boy is so adorable! He's lucky to have a mum who loves food so much. I've long had a fondness for boudoir but had never thought of making my own. I'm definitely going to give it a try. wonderful post! lucky to find it!! Ooh, I'd like to nibble his lovely cheeks! These photos are darling. I'm keeping the recipe at hand to make when friends' little ones visit. Lucky boy, lucky mom, lucky dad. Is a boudoir a lady finger? They sure look the same. Ian is a lucky little boy and so adorable. I used to make homemade teething bisquits for my boy. This recipe has inspired me to make my own cookies for my charlottes. This is my first time here. You have an amazing space and the cute pic of the little boy was the highlight of your post. Loved it! So cute. Interesting to hear about the effect of the cream of tartar. It's not a common ingredient in French baking, and I've never used it myself, so I'm curious: did you buy it in France, and if so, where ? Thank you for your kind comments! Judith, I think these are pretty much the same as lady fingers. Clotilde, cream of tartar can be a hard one. I started looking for it when I made nettle beer, and could not find it anywhere. My cream of tartar came with my sister the last time she visited. Since her visit, I remember seeing it in the baking section in a Carrefour in Savoie, and feeling the irony! I have heard that you can find it in Indian imports shops sometimes. Since your pharmacy isn't coming up with it, if you're friendly with your boulanger you might ask him where you might be able to get a few grams, or finally doing a search on ebay.fr -- there are some sellers that ship internationally. Otherwise, put it on your list of things to tell American friends when they ask - "what can I bring?" I was inspired and made these cookies two nights ago for our little girl. It's a very simple recipe although my boudoirs didn't come out as fluffy as yours look in the picture. I'll try the recipe again but I think next time I will mix the vanilla into the egg yolks. That might help my egg whites stand up a little better. Thanks for posting! Jennifer, thank you for your feedback! It is great to hear back. I am so glad you were inspired and sorry they weren't as fluffy as you liked. Yes, do make them again - switching the vanilla to the yolk side won't affect the flavor at all. Make sure you sift your flour, and beat your whites until quite stiff. Also be sure to carefully fold them together with the yolk mixture until just combined... Thank you again for your feedback. Delicious and hearty boudoirs!Your blog always provide a great comfort and interesting recipes! just stumbled upon your site - and oh my! gorgeous! this is a wonderful post. These look so good. My children would have loved these when they were little. Actually my 13 year old might still like them. Your baby looks like he likes your biscuits a lot. These sound and look lovely...and belong in a tin in my kitchen. Thank you for sharing the recipe. I can't wait to make them. You certainly can tell who enjoys eating these~how precious! I know this post was from a while back, so I understand if this does not get a response. You are supposed to cream the yokes and sugar? Hi Vanessa. It's perfectly fine to comment whenever you come around to trying this recipe. Yes, you'll want to cream the egg yolks and sugar, and then beat them a little bit longer even until they really turn a pale yellow color. This is to get as much air into them as you can.